Grounding Waters is the first discipline-specific mentoring program offered by The Blueprint Foundation using funding from the National Fish and Wildlife Foundation and the Oregon Department of Education Youth Development Council. In this program, students learn about careers in environmental science while taking an active role in environmental stewardship. 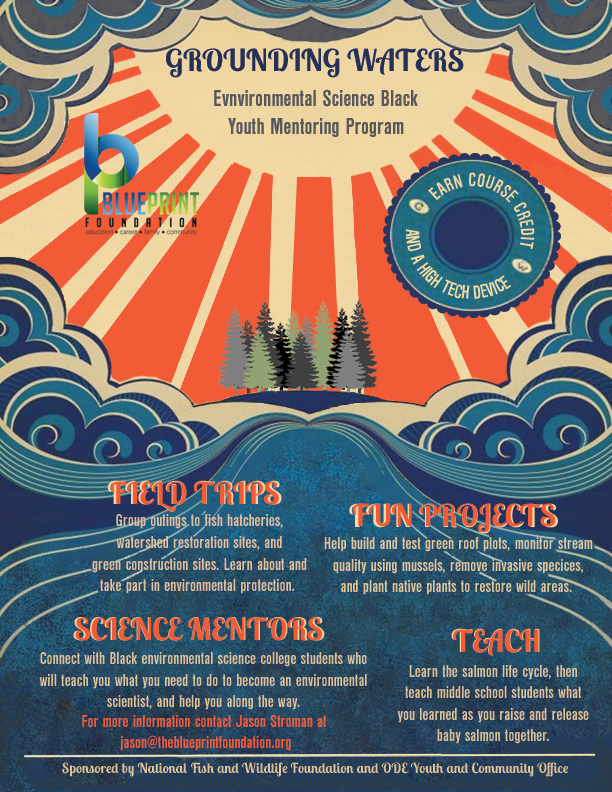 Professional and college student mentors of color join students on field trips to fish hatcheries, green infrastructure tours, and wildlife areas. Grounding waters is a service based mentoring program specifically designed to educate and empower Black youth to complete community service that increases 1) Black youth exposure to STEM professionals of color, 2) Black community members’ awareness of water quality related issues and mitigation strategies 3) environmental stewardship by Black community members, and 4) the number of Black youth who intend to pursue careers in the environmental sciences and engineering. To this end, we exercise best practices for fostering youth-driven community change through a 4-phase WISE model that has youth 1) Witness water quality issues within their urban watershed firsthand onsite learning and restoration activities, 2) Investigate the relative effectiveness of various green infrastructure mitigation efforts, 3) Select, based on their community needs, a green solution to design, implement, and monitor, and 4) Educate their community about the importance of their implemented change in practice.